Often in June and July we'll receive calls about round pink spots throughout peoples lawns. 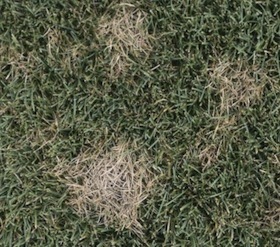 This common lawn disease is called Red Thread. Red Thread is the name of a particular nasty fungus that can grow in your yard during times of high heat and humidity. It's these conditions that make for an ideal time for the disease to grow and spread. The "Pink" or "Reddish" coloring on your grass is actually the fungus itself. The fungus loves hot & humid temperatures, and is usually brought on by watering at night. How Do I Treat Red Thread? Because Red Thread is a fungus, it will continue to grow and spread throughout the Ohio summer. It will naturally go away over the Winter, however your lawn will become susceptible to other diseases, and look terrible for the rest of the season. Your best bet to treat this common fungus is a selective fungicide that will kill it before it spreads even further. Prevent the spread of the fungus by watering in the morning, allowing any access water to evaporate in the morning sun. Watering at night will only worsen the problem. Also, remember to catch your grass clippings. Mowing with out a catcher will throw the infected blades into non-infected areas, causing it to spread. Weed Pro's Here to Help! If you think you have Red Thread, call a Weed Pro Technician today at 866-724-4555 to receive a FREE ESTIMATE on a fungicide application that will cure the problem. Download our FREE LAWN DISEASE GUIDE to learn more about Red Thread and other lawn diseases by clicking the button below.